The idea for this issue arose when we begin working on our film A Border Musical, whose screenplay is also printed here. This film is based on a study of the situation on both sides of the Russian-Norwegian border: we were interested in how a range of differences, which inevitably serve as sources of conflict in border areas, shape the subjectivity of people in daily contact with each other. Borderlands always aggravate differences – political and social, behavioral, linguistic and economic, and so on. 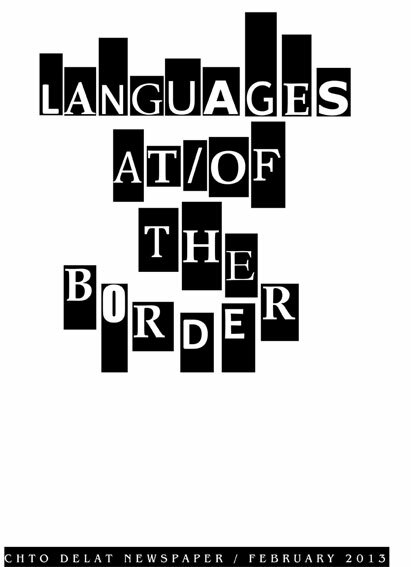 The border’s physicality, particularly in the form of rigid paramilitary zones impeding the free circulation of people, causes anyone who becomes caught up in their force fields to re-examine the world and themselves. On the map of the world, such areas have always been not only the focus of geopolitical tensions, but also special habitats encouraging the development of new forms of language, behavior and culture. The border is a place for experiment, a zone of mobility and change. The history of state borders has always been a history of violence: a history of wars, militarization, securitization, bureaucratic control, biopolitical regulation, forced displacement, flight and migration. Historically, state borders are shaped by the balance of violence. The winners dictate them to the losers, without taking into account either real geography or ethnicity. Borders separate “us” from “them,” and these divisions are set down in documents determining state loyalties and citizenship. Paradoxically, borders, which are always artificial forms, are an essential factor of existence, shaping not only the lives of people, but also impacting the natural environment and the animal world. Tanya, wife of Ola Nordmann. Former director of the children’s choir in the Russian town of Nikel, she plays the accordion. She still has a poor grasp of Norwegian. A Chorus of Miners. Manifestations of Tanya’s conscience, her “inner miners,” the men double as workers at the local mine and processing plant. Ola Nordmann (“John Q. Public”), Tanya’s husband. Owner of a trucking company, Ola himself enjoys getting behind the wheel of a big truck from time to time. A Friend. Ola Nordmann’s schoolmate, he currently works in the civil service.